We previously reported that macrophage exposure to attenuated strains of pathogenic mycobacteria at multiplicities of infection (MOI) ≤ 10 triggers TNF-α-mediated apoptosis which reduces the viability of intracellular bacilli. Virulent strains were found to suppress macrophage apoptosis, and it was proposed that apoptosis is an innate defense against intracellular Mycobacterium tuberculosis analogous to apoptosis of virus-infected cells. The potential similarity of host cell responses to intracellular infection with mycobacteria and viruses suggests that M. tuberculosis might lyse infected macrophage when that niche is no longer needed. To investigate this question, we challenged murine macrophages with high intracellular bacillary loads. A sharp increase in cytolysis within 24 h was observed at MOI ≥ 25. The primary death mode was apoptosis, based on nuclear morphology and phosphatidyl serine exposure, although the apoptotic cells progressed rapidly to necrosis. Apoptosis at high MOI differs markedly from low MOI apoptosis: it is potently induced by virulent M. tuberculosis, it is TNF-α-independent, and it does not reduce mycobacterial viability. Caspase inhibitors failed to prevent high MOI apoptosis, and macrophages deficient in caspase-3, MyD88, or TLR4 were equally susceptible as wild type. Apoptosis was reduced in the presence of cathepsin inhibitors, suggesting the involvement of lysosomal proteases in this novel death response. We conclude that the presence of high numbers of intracellular M. tuberculosis bacilli triggers a macrophage cell death pathway that could promote extracellular spread of infection and contribute to the formation of necrotic lesions in tuberculosis. Macrophages are the primary target for intracellular invasion by Mycobacterium tuberculosis and provide an essential niche to establish infection in the host (1). We previously reported that at low multiplicities of infection (MOI),3 attenuated M. tuberculosis strains induce apoptosis of human alveolar macrophage by a two-step mechanism involving the release of TNF-α and priming for TNFR-1-mediated death signaling through the extrinsic pathway (2). Several lines of evidence suggest that macrophage apoptosis in this context represents an innate defense against intracellular infection, analogous to the established role for apoptosis of virus-infected cells (3). At low MOI (≤10), the attenuated strains Mycobacterium bovis bacillus Calmette-Guérin (BCG) and M. tuberculosis H37Ra are much stronger apoptosis inducers than all virulent strains tested including wild-type M. bovis, M. tuberculosis H37Rv, and Erdman as well as clinical isolates (2, 4, 5, 6). Intracellular BCG and H37Ra are killed when host macrophages undergo TNF-α-mediated apoptosis, while virulent strains grow inside host macrophages that remain viable (4). The virulence-associated trait of apoptosis suppression by M. tuberculosis involves several mechanisms including induction of the antiapoptotic BCL-2 family member MCL-1 and interference with TNF-α signaling at the level of TNFR-1 (7, 8, 9). Macrophage apoptosis packages intracellular bacilli in membrane-bound vesicles, facilitating Ag presentation by dendritic cells and possibly enhancing the antimicrobial efficacy of newly recruited macrophages (10, 11). Cytolytic viruses initially act to maintain host cell viability through antiapoptotic signals to preserve an intracellular environment supporting viral replication. When the usefulness of the host cell is expended, virus particles are released to the extracellular space by precipitating necrotic death of the infected cell. We questioned whether a similar exit strategy exists for M. tuberculosis in macrophages. To model the effects of high intracellular mycobacterial load, we challenged primary murine macrophages with attenuated BCG or virulent M. tuberculosis Erdman at MOI ≥ 25. As detailed in this report, high MOI challenge induces macrophage apoptosis through a mechanism distinct from that described for low MOI. High MOI apoptosis does not require TNF-α, caspases, or Toll signals. It occurs with faster kinetics than low MOI apoptosis and proceeds rapidly to necrosis without compromising mycobacterial viability. We postulate that macrophage cell death at high MOI represents a mechanism for the release and extracellular spread of virulent M. tuberculosis in the host. Caspase-3 inhibitor benzyloxycarbonyl-Asp-Glu-Val-Asp-fluoromethylketone (Z-DEVD-fmk), pan-caspase inhibitor benzyloxycarbonyl-Val-Ala-Asp-fluoromethyl ketone (Z-VAD-fmk), and neutralizing anti-mouse TNF-α mAb were purchased from R&D Systems. The actin polymerization inhibitor cytochalasin D, a membrane-permeable Ca2+ chelator (BAPTA-AM), the antioxidants polyethylene (polyethylene glycol (PEG))-superoxide dismutase and PEG catalase, and the NO synthase inhibitor NG-monomethyl-l-arginine monoacetate (l-NMMA) were purchased from Sigma-Aldrich. The protein kinase inhibitor staurosporine (Sigma-Aldrich) was used as a positive control for apoptosis. The cathepsin L inhibitor benzyloxycarbonyl- Leu-Leu-Tyr-fluoromethylketone (Z-LLY-fmk), the cathepsin B inhibitor [l-3-trans-(propylcarbamoyl)oxirane-2-carbonyl]-l-isoleucyl-l-proline methyl ester (CA-074-Me), and the cathepsin D inhibitor pepstatin A were purchased from Calbiochem. All three inhibitors were used at a concentration of 40 μM, which was nontoxic for macrophage and provided maximum inhibition of cell death. Bone marrow cells were collected from C57BL/6 and BALB/c mice maintained in specific pathogen-free conditions. No difference was found in cell death rate by high MOI M. tuberculosis infection between the two strains. MyD88−/− mice and TLR4−/− mice were provided by Dr. D. Golenbock (University of Massachusetts Medical School, Worcester, MA). Caspase-3−/− mice were provided by Dr. T. Mak (AMDI, Toronto, Ontario, Canada). For experiments with each knockout model, experimental groups of mice were matched for strain, age (within 1–2 wk), and gender. Bone marrow-derived macrophages were prepared by culturing bone marrow cells in DMEM medium (Invitrogen Life Technologies) supplemented with 10% L929-conditioned medium, 10% FBS (BioWhittaker), 100 U/ml penicillin, 100 mg/ml streptomycin, and 2 mM glutamine (complete DMEM) for 5 days. Differentiated bone marrow-derived macrophages were detached from 100-mm petri dishes, counted, and plated in a Lab-Tek tissue culture chamber slide (Nalge Nunc International) at 2 × 105 cells/well. Cells were infected with M. tuberculosis Erdman (Trudeau Institute Mycobacterial Culture Collection, Saranac Lake, NY), M. bovis BCG Pasteur (American Type Culture Collection), or rBCG-expressing GFP (BCG-GFP; gift of V. Deretic, University of New Mexico, Albuquerque, NM) at various MOIs in complete DMEM at 37°C for 3 h and then washed to remove unbound mycobacteria and further incubated in complete DMEM. At the end of infection, cells were washed with PBS one time and stained with 10 μg/ml PI for 10 min at room temperature. Cells were washed with PBS three times and fixed with 4% paraformaldehyde for 20 min at room temperature. Cells were then washed two times with distilled water and stained with 0.5 μg/ml DAPI for 2 min. Cells were washed three times with distilled water and the slides were dried and mounted for fluorescence microscopy. Based on PI/DAPI double staining, the status of cells was divided into four categories: live cells were PI-negative with uncondensed nuclei; apoptotic cells were PI-negative with condensed nuclei; necrotic cells were PI-positive with uncondensed nuclei; and “apoptonecrotic” cells were PI-positive with condensed nuclei. Adherent macrophages were detached by incubation in cold 0.02% EDTA solution (Sigma-Aldrich) for 30 min. Detached cells were washed twice with PBS and then resuspended in 100 μl of annexin-binding buffer (BD Pharmingen) with 5 μl of Annexin VFITC (BD Pharmingen) and 50 μg/ml PI (Molecular Probes). After staining, 300 μl of annexin-binding buffer containing 1% paraformaldehyde was added, and the stained cells were analyzed on a LSR flow cytometer (BD Biosciences) with CellQuest software. For maximum sensitivity, cells were analyzed <30 min after the staining. Mycobacterial stock stored at −70°C were thawed and divided into three tubes. One tube was kept at room temperature, a second tube was heated to 60°C for 30 min, and the third tube was treated with streptomycin (100 μg/ml) for 30 min at room temperature. Heat and streptomycin treatment reduced mycobacterial viability by 100- and 10-fold, respectively, based on CFU assay. To measure mycobacterial viability after infection, macrophages were plated in 24-well plates at 2 × 105 and infected with M. tuberculosis Erdman (MOI 25). An equal number of fresh macrophages was added to infected cultures either 3 or 24 h after the initial infection. In a different culture, mycobacterial viability was measured 3, 48, or 72 h after the addition of fresh macrophages by lysing the cells in 0.25% saponin dissolved in PBS with 0.05% Tween 80 (20 min, 37°C) to release intracellular bacilli. Cell culture supernatant was also collected to include mycobacteria released into media during the infection. Serial 10-fold dilutions of infected cell lysates were prepared in PBS with 0.05% Tween 80, and then 100 μl of each dilution was plated in duplicate on Middlebrook 7H11 agar plates. Colonies were counted 16 and 21 days after plating. Differences between groups were assessed by Student’s t test using InStat (GraphPad Software). Values of p < 0.05 were considered statistically significant. To assess the relationship between intracellular bacillary load and macrophage viability, murine bone marrow-derived macrophages were challenged with M. tuberculosis Erdman, BCG, or Mycobacterium smegmatis over an MOI range from 5 to 50. Cultures of infected macrophages were assessed by PI and DAPI staining at 3, 6, and 20 h after the addition of mycobacteria. M. tuberculosis and BCG induced a steep increase in PI-positive cells by 20 h at a MOI ≥ 25, with the virulent Erdman strain exhibiting stronger cytolytic activity than attenuated BCG (Fig. 1⇓A). In contrast, M. smegmatis at MOI 25 or 50 caused only a minimal increase in PI staining. By fluorescence microscopy, we counted an average of 22 intracellular bacilli (range 10–40) in PI-positive macrophages challenged at MOI 25, which is close to the intended bacterial load. We previously found that low MOI (≤10) infection with BCG or H37Ra induces macrophage apoptosis with delayed kinetics, peaking between 3 and 4 days after infection (2, 6). In the present study, using M. tuberculosis at a MOI 25, 10% of cells were dead (PI-positive) by 3 h, 50% were dead by 6 h, and by 20 h, ∼90% cells were PI-positive (Fig. 1⇓B). These results indicate that macrophage cytolysis with high MOI challenge proceeds at a faster pace than occurs after low MOI challenge, and it is followed by the early appearance of necrosis defined by the loss of membrane integrity. We postulate that high MOI challenge models events occurring when, after entry at low MOI, virulent M. tuberculosis grows to a critical threshold and triggers death of the host macrophage. To test this assumption, the viability of macrophages challenged with M. tuberculosis Erdman at MOI 10 was assessed by PI staining 20 and 72 h later (Fig. 1⇓C). After 72 h, allowing the intracellular bacillary load to undergo approximately two doublings, there was a marked increase in macrophage cell death that was not inhibited by neutralizing endogenous TNF-α. As described below (Fig. 2⇓B and see Fig. 5⇓A), independence from TNF-α is a characteristic of high MOI cytotoxicity. High MOI challenge with M. tuberculosis Erdman rapidly induces macrophage cell death. A, Bone marrow-derived macrophages were infected with Erdman, BCG, or M. smegmatis over a range of MOI for 20 h and stained with PI to assess cell viability. Results are expressed as the mean percentage of PI-positive cells ± SD for three experiments. ∗, p < 0.05 comparing macrophages infected with Erdman or BCG. B, Macrophages were infected with Erdman (MOI = 25) for 3, 6, or 20 h, and then stained with PI. C, Macrophages infected with Erdman at MOI 10 were stained with PI 20 or 72 h later. Similar results were obtained in three individual experiments. Cell death induced by M. tuberculosis at high MOI is characteristic of apoptosis. A, Macrophages were infected with M. tuberculosis Erdman (Mtb) or treated with staurosporine (5 μM) for 3 h and then stained with PI, followed by fixation and DAPI staining for examination by fluorescence microscopy (×400). Red arrows, Condensed nuclei; white arrows, PI-positive cells. B, Macrophages incubated with media only, anti-TNF-α mAb alone, M. tuberculosis alone (MOI 25), or M. tuberculosis plus anti-TNF-α mAb for 6 h were stained with PI and DAPI and classified into live, apoptotic, necrotic, and apoptonecrotic as described in Materials and Methods. C, Macrophages infected with BCG for 9 h were stained with Annexin V and PI for analysis by flow cytometry. To assess whether M. tuberculosis at high MOI directly induces macrophage necrosis, or whether the death mode in this condition is initially apoptotic, infected macrophages were double-stained with DAPI to track nuclear pyknosis (apoptosis) and PI to probe loss of cell membrane integrity (necrosis). Representative fluorescence micrographs (Fig. 2⇑A) show that all PI-positive M. tuberculosis-infected cells have condensed nuclei consistent with a primarily apoptotic cell death. At least 200 cells in each condition were counted to quantify the proportion of live cells (PI-negative with normal nuclear morphology), apoptotic cells (PI-negative with nuclear condensation), necrotic cells (PI-positive without nuclear condensation), or apoptotic cells undergoing secondary necrosis (PI-positive with nuclear condensation). Cumulative results (Fig. 2⇑B) confirm that over 90% of PI-positive cells had evidence of apoptosis by nuclear morphology. Despite the uniform appearance of nuclear condensation, fragmentation of nuclei in M. tuberculosis-infected macrophages was not observed. This atypical feature might be a consequence of the rapid progression to necrosis, or possibly reflect a unique mechanism of apoptotic cell death. The predominance of apoptotic cell death after high MOI challenge was confirmed by flow cytometry with staining for annexin V and PI performed 9 h after infection with BCG (Fig. 2⇑C). Sixteen percent of cells were annexin V single-positive (apoptotic), 32% were annexin V and PI double-positive (apoptotic with secondary necrosis), while only 6% were PI single-positive (necrotic without evidence of apoptosis). Together, these data indicate that M. tuberculosis and BCG at high MOI predominantly induce macrophage apoptosis which rapidly progresses to necrosis. It is notable that secondary necrosis of cells infected with virulent M. tuberculosis Erdman develops faster than after staurosporine-induced apoptosis (Fig. 2⇑A) or with low MOI M. tuberculosis H37Ra or BCG challenge (Ref.12 and our unpublished observations). To test whether high MOI apoptosis requires cell association with mycobacteria, macrophages were infected with GFP-expressing BCG at MOI 25, washed 3 h later to remove unbound mycobacteria, and then cocultured with an equal number of fresh uninfected macrophages. Six hours later, the cells were examined by fluorescence microscopy (Fig. 3⇓A). 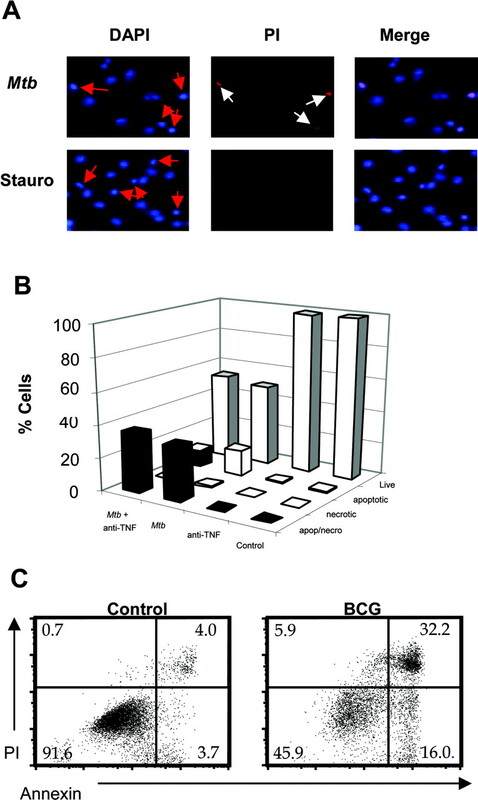 All PI-positive cells were associated with high numbers of BCG-GFP, while uninfected cells were uniformly PI-negative. There was no evidence for bystander apoptosis with these conditions. The requirement of phagocytosis for infection-induced apoptosis was further investigated by challenging macrophages with M. tuberculosis in the presence or absence of cytochalasin D (Fig. 3⇓B). Cytochalasin D inhibited apoptosis of infected cells in a dose-dependent manner, with complete inhibition at a concentration of 1 μM. Cytochalasin D did not inhibit staurosporine-induced macrophage apoptosis (data not shown), supporting the conclusion that its protective effect for cells challenged with M. tuberculosis was due to inhibition of phagocytosis rather than by any intrinsic antiapoptotic activity. These results indicate that under the conditions used for our studies, macrophage cell death is not triggered by engagement of surface receptors but requires the presence of intracellular bacilli. Phagocytosis of mycobacteria is a prerequisite for macrophage cell death. A, Macrophages were infected with BCG-GFP for 3 h, washed, and then an equal number of fresh macrophages were added to the cultures. Six hours later, cells were stained with PI. The GFP, PI, and phase images are superimposed (×400). White arrows, Macrophages with no intracellular bacilli. B, Macrophages were infected with M. tuberculosis Erdman in the presence or absence of cytochalasin D for 20 h. Results are expressed as the mean percentage of PI-positive cells ± SD for three experiments. ∗, p < 0.05 comparing infected cells with or without cytochalasin D treatment. Prior studies of low MOI with H37Ra demonstrated that TNF-α-mediated macrophage apoptosis was triggered by live but not heat-inactivated bacilli, suggesting that the signals priming for apoptosis arise from viable intracellular bacilli (2). We examined the requirement of mycobacterial viability for the induction of high MOI macrophage apoptosis by inactivating M. tuberculosis with heat (60°C for 30 min) or with streptomycin (100 μg/ml for 30 min). Heat inactivation and streptomycin treatment reduced the bacterial viability by 2 and 1 logs, respectively, based on CFU assay but did not reduce the bacterial phagocytosis by macrophages (data not shown). 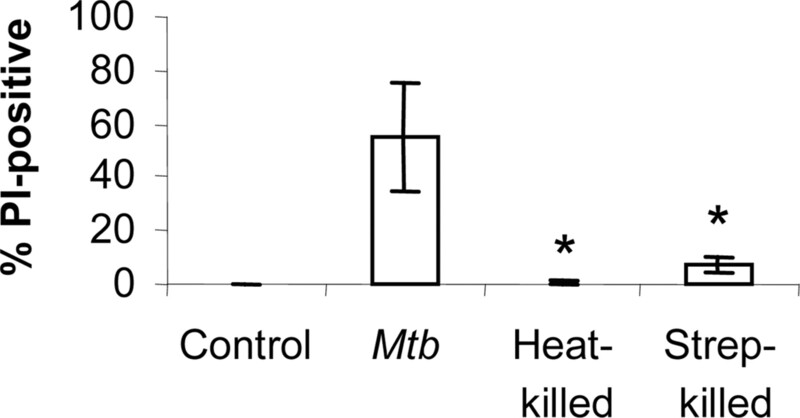 Both heat inactivation and streptomycin abrogated the cytopathicity of M. tuberculosis (Fig. 4⇓). Together, these results indicate that macrophage apoptosis after high MOI challenge is a response to metabolically active mycobacteria residing in an intracellular compartment. Only viable bacilli induce macrophage cell death. M. tuberculosis Erdman bacilli were inactivated by heat (60°C, 30 min) or streptomycin (100 μg/ml, 30 min). Cultured cells were inoculated with 25 live or inactivated bacilli per macrophage. After 20 h, PI and DAPI double-stained cells were examined by fluorescence microscopy. Relative cell death is expressed as the mean percentage of PI-positive cells ± SD for three experiments. ∗, p < 0.05 comparing macrophages challenged with viable bacilli vs inactivated bacilli. Macrophage apoptosis induced by H37Ra or BCG at low MOI is strictly dependent on endogenous TNF-α (2, 5, 6). Consistent with this extrinsic cell death pathway, we found that low MOI apoptosis of THP-1 cells was inhibited by transduction with a retroviral vector expressing the pan-caspase inhibitor CrmA (6). In contrast, apoptosis of macrophages challenged with M. tuberculosis at MOI 25 in the present study was not blocked by neutralizing anti-TNF mAb (Figs. 2⇑B and 5⇓A) or by cell-permeable caspase inhibitors (Fig. 5⇓, B and C). Apoptosis induced by BCG at high MOI was similarly caspase and TNF-α independent (data not shown). Moreover, macrophages from mice with targeted deletion of caspase-3 were fully susceptible to infection-induced apoptosis (Fig. 5⇓D). Thus, high MOI macrophage apoptosis appears to proceed by a mechanism independent of caspases or TNF-α which is distinct from that induced by mycobacteria at low MOI. This TNF-α-independent cell death induced by M. tuberculosis Erdman at high MOI was also observed with primary human alveolar macrophages (data not shown). High MOI apoptosis does not require TNF-α or caspase activity. Macrophages were infected with M. tuberculosis Erdman (MOI 25) in the presence or absence of neutralizing anti-mouse TNF-α mAb (5 μg/ml) (A), Z-DEVD-fmk (B), or Z-VAD-fmk (C). 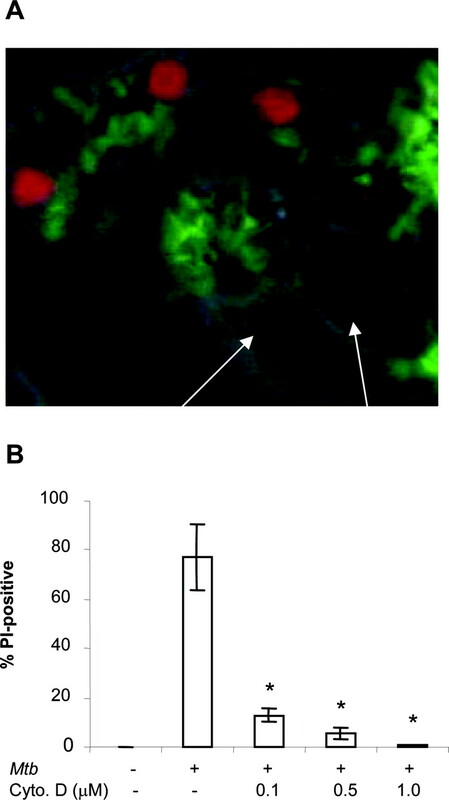 Macrophage viability was assessed by PI staining 20 h postinfection, and results are expressed as the percentage of PI-positive cells ± SD for three experiments. D, Macrophages from caspase-3−/− mice and matching wild-type (WT) controls were infected with M. tuberculosis Erdman and stained with PI to compare viability 20 h postinfection. Calcium influx, NO, and reactive oxygen intermediates (ROI) have all been linked to apoptosis of monocytic cells (13, 14, 15, 16). In other reports, calcium influx and NO, (13, 14) but not ROI (17), were reported to play essential roles in the death of M. tuberculosis-infected macrophage cell lines. We found no reduction in apoptosis of primary murine macrophages challenged with M. tuberculosis Erdman (MOI 25) in the presence of the NO synthase inhibitor l-NMMA, or in the presence of the cell-permeable antioxidants PEG-superoxide dismutase or PEG catalase (data not shown). 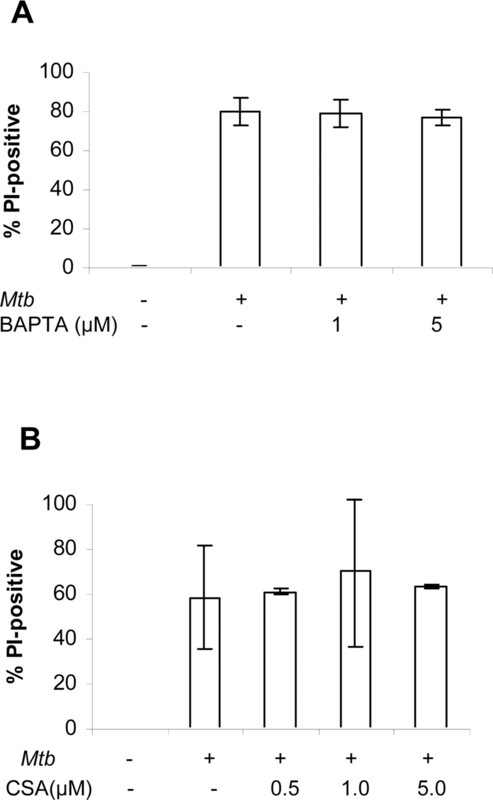 The membrane-permeable calcium chelator BAPTA-AM was previously shown to inhibit apoptosis of B10R cells infected with M. tuberculosis H37Rv (14). However, in the present study, BAPTA-AM failed to rescue primary murine macrophages from apoptosis in response to M. tuberculosis Erdman at MOI 25 (Fig. 6⇓A). 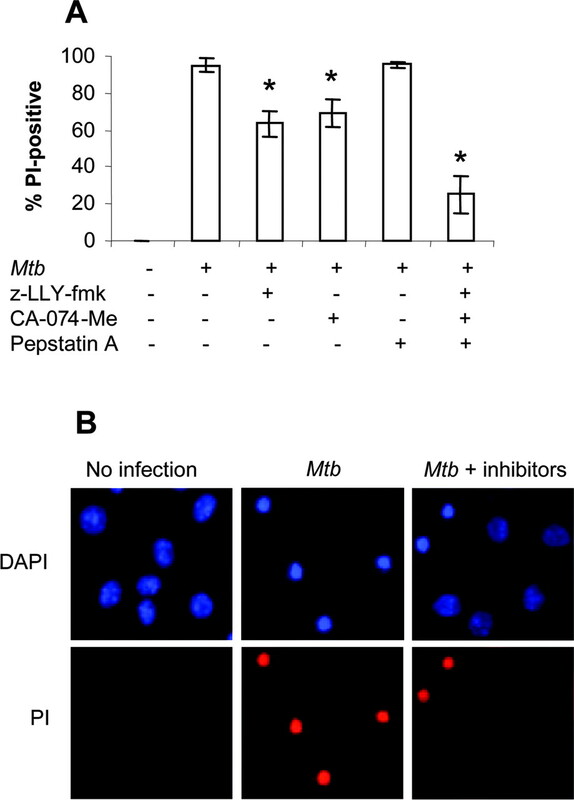 Intracellular calcium chelation and inhibition of MPT fail to prevent high MOI apoptosis. Macrophages were infected with M. tuberculosis Erdman (MOI 25) in the presence or absence of BAPT-AM (A) or CsA (B). After 20 h, cells were stained with PI and DAPI and then examined by fluorescence microscopy. Cell death is expressed as the mean percentage of PI-positive cells ± SD for three experiments. Mitochondrial damage with irreversible mitochondrial permeability transition (MPT) has been implicated in necrosis of M. tuberculosis-infected macrophages (18). Gan et al. (12) recently reported that cyclosporine A (CsA), an inhibitor of MPT, delays secondary necrosis of primary human monocyte-derived macrophages infected with M. tuberculosis H37Ra at low MOI without preventing apoptosis as evidenced by DNA fragmentation. In the present study, PI staining data indicated that apoptosis of macrophages infected with M. tuberculosis or BCG at high MOI rapidly progresses to necrosis. We questioned whether CsA would delay the onset of necrosis in this setting as it does with low MOI challenge. As shown in Fig. 6⇑B, CsA treatment of macrophages infected with M. tuberculosis at MOI 25 did not reduce the proportion of PI-positive cells measured at 20 h. This experiment provides additional evidence that dissimilar types of macrophage cell death are induced by M. tuberculosis at high and low MOI. TLR2 has been linked to Mycobacterium-induced macrophage apoptosis in a MyD88-dependent manner (19, 20), while TLR4 was reported to mediate LPS-induced macrophage apoptosis through a MyD88-independent pathway (21). To investigate whether TLRs are responsible for high MOI-induced apoptosis, we compared macrophages from MyD88−/− and TLR4−/− mice with the matching wild-type macrophages infected with M. tuberculosis at MOI 25. There was no significant difference in PI-positive cells between knockout and wild-type macrophages (Fig. 7⇓), suggesting that TLR signals are not responsible for this cell death response. TLR signals are not required for high MOI M. tuberculosis-induced apoptosis. 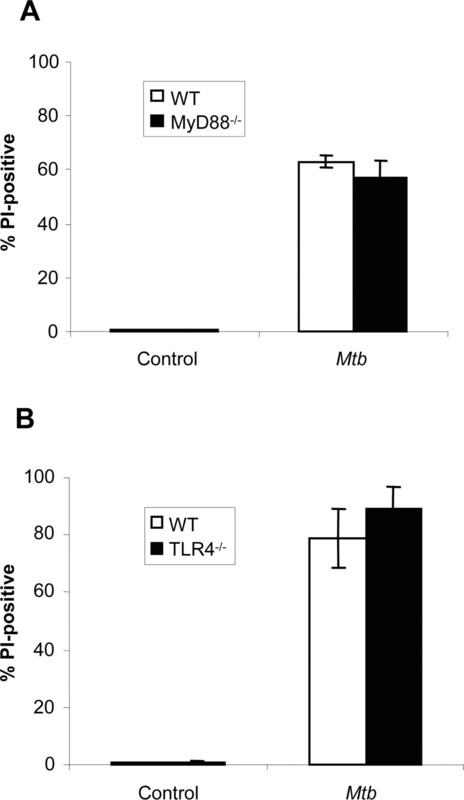 Macrophages from MyD88−/− (A), TLR4−/− (B), or matching wild-type (WT) mice were infected with M. tuberculosis Erdman (MOI 25). After 20 h, viability was assessed by fluorescence microscopy of PI- and DAPI-stained cells. Cell death is expressed as the mean percentage of PI-positive cells ± SD for three experiments. Caspase-independent apoptosis mechanisms include those triggered by cytosolic translocation of lysosomal proteases (22). As an example, cathepsin D was reported to cause caspase-independent apoptosis of T cells activated with anti-CD2 plus IL-2 and exposed to a low dose of staurosporine (23). While cathepsins B, D, and L were all found to translocate to the cytosol, the cathepsin D inhibitor pepstatin A specifically blocked apoptosis of activated T cells. To determine whether the caspase-independent killing of macrophages by M. tuberculosis at high MOI involves a lysosomal pathway, we tested the ability of cell-permeable cathepsin inhibitors to block this response. These compounds included pepstatin A, CA-074-Me, and Z-LLY-fmk (inhibitors of cathepsins D, B, and L, respectively). Pepstatin A had no effect but CA-074-Me and Z-LLY-fmk reduced macrophage cell death assessed using PI staining and fluorescence microscopy by 26 and 32%, respectively (Fig. 8⇓A). When all three cathepsin inhibitors were combined, PI staining was reduced by 70%. The suppressive effect of CA-074-Me and Z-LLY-fmk suggests that high MOI apoptosis is at least partially dependent on the release of lysosomal proteases. Examination of DAPI-stained cells showed that the macrophages rescued with the mixture of cathepsin inhibitors had intact nuclei (Fig. 8⇓B), indicating that lysosomal proteases play an initiating role in apoptosis rather than simply facilitating secondary necrosis. The precise identify of the lysosomal proteases involved in high MOI apoptosis is uncertain since Z-LLY-fmk inhibits calpain as well as cathepsin L, and it might not be highly specific for these two proteases at the concentration used (22). Cathepsin inhibitors protect the viability of infected macrophages. A, Macrophages were infected with M. tuberculosis Erdman (MOI 25) in the presence or absence of 40 μM Z-LLY-fmk, CA-074-Me, pepstatin A, or all three inhibitors combined. After 20 h, cells were stained with PI and DAPI and then examined by fluorescence microscopy. Cell death is expressed as mean percentage of PI-positive cells ± SD for five experiments. ∗, p < 0.05 compared with untreated M. tuberculosis-infected macrophages. B, Fluorescence micrographs of uninfected macrophages, and M. tuberculosis-infected macrophages treated with all three cathepsin inhibitors combined (×400). The cells treated with cathepsin inhibitors demonstrate a reduction in PI-positive dead cells, and also a reduction in the number of cells with nuclear pyknosis characteristic of apoptosis. The viability of intracellular mycobacteria is reduced in the setting of TNF-α-mediated apoptosis after low MOI challenge (2, 4, 6). Similar antimycobacterial effects were reported by others using macrophages treated with apoptosis-inducing drugs, or through stimulation of Fas (24, 25). In contrast to the killing effect of low MOI apoptosis, M. tuberculosis CFU increased over 48 h in apoptotic macrophages at MOI 25 (Fig. 9⇓A). Fratazzi et al. (11) previously demonstrated that apoptosis of infected macrophages renders intracellular M. avium susceptible to killing by freshly added macrophages. It was proposed that bacilli packaged within apoptotic bodies are vulnerable to the antimicrobial functions of naive macrophages. This was not observed when the infected macrophages were made necrotic by sonication before adding fresh cells. In contrast, M. avium released from necrotic macrophages grew rapidly in the extracellular culture medium despite the addition of fresh macrophages. To model the recruitment of naive macrophages to foci of infection, we infected murine macrophages with M. tuberculosis at MOI 25, and then added an equal number of fresh macrophages 3 or 24 h later. Adding fresh macrophages 3 h after the primary infection, when the originally infected cells were entering apoptosis, resulted in a net reduction in CFU from the input bacterial load. In contrast, adding fresh macrophages at 24 h, when the infected cells had become necrotic, failed to reduce the bacterial load (Fig. 9⇓B). High MOI apoptosis is not directly microbicidal for intracellular M. tuberculosis, but conditions bacilli for killing by fresh macrophages. Cells were infected with M. tuberculosis Erdman (MOI 25) for 3 h (A) or 24 h (B) before the addition of an equal number of fresh macrophages (Add) or no additional macrophages (No add). 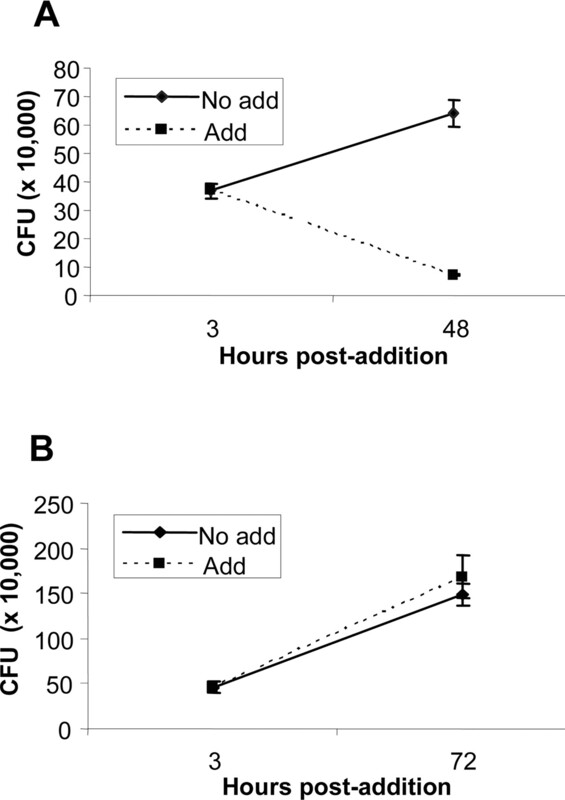 Duplicate wells were harvested for determination of CFU 3 h after the addition of fresh macrophages, and after a further 48 or 72 h as indicated. Results are expressed as mean CFU ± SD for triplicate wells. We investigated the impact of high intracellular M. tuberculosis load on the viability of primary macrophages. In contrast to our prior studies of low multiplicity infection, we found that virulent M. tuberculosis Erdman at MOI ≥ 25 had equal or greater cytotoxic potential than the attenuated strain BCG. Apoptosis at high MOI is triggered only by live intracellular bacilli, similar to the low MOI setting, but the mode of cell death is distinct. While high MOI M. tuberculosis-induced cell death is primarily apoptotic in nature, it is independent of TNF-α, caspases, ROI or nitrogen intermediates, calcium flux, or TLR signals. High MOI apoptosis also differs from low MOI apoptosis by its rapid pace and progression to necrosis. The speedy transition to necrosis might explain the lack of direct microbicidal activity that we previously described for the slower paced apoptosis induced by TNF-α at low MOI, and that others reported in the setting of Fas-mediated apoptosis (2, 6, 25). The death-signaling pathway invoked at high MOI appears to involve lysosomal proteases, since PI permeability and nuclear pyknosis were reduced by the cathepsin L and calpain inhibitor Z-LLY-fmk, and by the cathepsin B inhibitor CA-074-Me. Combining different cathepsin inhibitors increased the protective effect, indicating the likely involvement of more than one protease in this process. These data suggest that apoptosis is initiated by lysosomal proteases, albeit with features atypical from some previously described examples of cathepsin- or calpain-mediated cell death where roles for cathepsin D, caspases, superoxide, and calcium have variously been identified (23, 26, 27, 28, 29). Further studies are underway to discover the initiating factors for this apparently unique macrophage cell death pathway. The different forms of macrophage apoptosis at low and high MOI might reflect particular requirements of innate defense against initial infection with M. tuberculosis vs mycobacterial virulence mechanisms in the setting of established tuberculosis disease. Leemans et al. (1) demonstrated that depleting mice of alveolar macrophages reduces the ability of M. tuberculosis to establish infection after aerosol challenge, whereas macrophage depletion significantly increases susceptibility to Streptococcus pneumoniae (1, 30). In humans, inhalation of <10 bacilli is sufficient to establish infection with the pool of >109 resident alveolar macrophages (31, 32), clearly an extremely low MOI. Alveolar macrophages are relatively incapable of restricting M. tuberculosis growth by the usual innate mechanisms of phagosomal acidification and fusion with lysosomes (33, 34). Apoptosis is an alternative defense strategy that could benefit the host in the early stages of infection by denying M. tuberculosis its preferred growth niche, by amplifying and broadening the adaptive immune response through dendritic cell activation and Ag cross-presentation, and by direct antimycobacterial activities unique to apoptotic macrophages (2, 6, 10, 12, 24). It is therefore unsurprising that virulent M. tuberculosis strains express antiapoptotic countermeasures at low MOI. Once intracellular infection of macrophages is established, the priority for virulent M. tuberculosis must eventually shift to favor extracellular growth that is necessary for transmission to the next host. Macrophage cytolysis as demonstrated in our experiments could satisfy several requirements for tuberculosis pathogenesis. First, this death pathway operates only in the presence of high intracellular bacillary load that would accumulate after a small initial inoculum grows in the protected environment of the host cell. Second, high MOI apoptosis lacks the intrinsic microbicidal activity observed in macrophages made apoptotic by TNF-α and various other stimuli, possibly due to the rapid transition to necrosis. Finally, necrosis of infected macrophages could condition the local environment to support extracellular mycobacterial growth. In this regard, Fratazzi et al. (11) found that extracellular growth of M. avium was enhanced in medium supplemented with the residue of necrotic macrophages. Necrosis following high MOI apoptosis of M. tuberculosis-infected macrophages might contribute to the process of caseation that typifies tuberculosis in the human host. In the guinea pig, necrosis in caseating granulomas was found to precede the expression of adaptive immunity (35). This implies that necrotic lesions in tuberculosis arise from innate macrophage-pathogen interactions rather than by the action of CTL. The importance of macrophage apoptosis vs necrosis in tuberculosis defense was highlighted by the recent discovery of the Ipr1 gene whose absence results in profound tuberculosis susceptibility in mice. Mice lacking Ipr1 fail to restrict M. tuberculosis growth in the lungs and experience early mortality with extensive pulmonary necrosis (36). Macrophages lacking Ipr1 expression undergo M. tuberculosis-induced necrosis in vitro, while macrophages expressing Ipr1 respond to infection with apoptosis. These findings support the hypothesis that apoptosis of infected macrophages contributes to control of tuberculosis by the host, while macrophage necrosis is detrimental to host defense. Other laboratories reported that surface engagement of TLR2 by mycobacteria or by purified M. tuberculosis 19-kDa lipoprotein can trigger apoptosis of macrophages and monocytic tumor cells (19, 37). In contrast to those reports, we found that macrophage apoptosis with high or low MOI challenge requires viable intracellular bacteria, and that high MOI apoptosis occurs in the absence of MyD88 or TLR4. Our failure to observe apoptosis induction by extracellular bacilli presumably reflects differences in the nature or activation state of the target cells, and/or different culture and stimulation conditions. We found that the same heat-inactivated mycobacteria that are nontoxic for primary murine and human macrophages in our experiments do trigger apoptosis of PMA-differentiated THP-1 cells (our unpublished observations). Our data presented here are consistent with a report that M. tuberculosis-induced apoptosis of a murine macrophages cell line (B10R) was blocked by concomitant treatment with antimycobacterial drugs (38). Indeed, while metabolically active M. tuberculosis H37Rv was shown to induce apoptosis of B10R cells, apoptosis was inhibited by cotreatment with heat-killed mycobacteria, mannose-capped lipoarabinomannan, or LPS (13), indicating the potential for cell survival signals through TLR and mannose receptors. Another proposed mechanism for macrophage cytolysis by M. tuberculosis is through an effect of early secreted anigenic target-6 to permeabilize cell membranes, leading to a catastrophic ion flux (39, 40). The genes encoding early secreted antigenic target-6 and its associated export system are contained in the region of difference 1 region that is present in M. tuberculosis but deleted in BCG. Our experiments demonstrate that BCG is fully capable of inducing high MOI apoptosis, although perhaps with modestly lower potency than M. tuberculosis Erdman. Activation of the high MOI macrophage lysosomal death pathway we have identified does not appear to require region of difference 1 genes. With growing attention to the topic of macrophage apoptosis in tuberculosis an increasingly complex picture of this host-pathogen interaction is emerging. We have identified distinct TNF-α-dependent and -independent apoptosis responses, depending on the intracellular bacterial load. Caspase-mediated apoptosis was shown by others to be triggered by ligation of cell surface TLR2 with purified 19-kDa lipoprotein, or by whole M. tuberculosis bacilli in a 19-kDa lipoprotein-dependent manner (19, 37). A role for autophagy in the innate antimicrobial response of M. tuberculosis-infected macrophages was recently described (41). While commonly functioning as a survival mechanism for stressed cells, autophagy can culminate in cell death (42). It is likely that multiple death pathways operate simultaneously in M. tuberculosis-infected macrophages, with one mechanism predominating based on host and pathogen variables that remain to be fully defined. Finally, it is recognized that CTL induce apoptosis of M. tuberculosis-infected macrophages through Fas and granzyme-dependent pathways. Together, these findings broadly indicate that the host devotes considerable resources to induce apoptosis of M. tuberculosis-infected macrophages. We propose a model in which macrophage apoptosis mediated by TNF-α constitutes a protective host response to initial low MOI with M. tuberculosis. Once infection is established and optimal intracellular growth is achieved, then a caspase-independent lysosomal apoptotic cell death with rapid progression to necrosis serves as a mycobacterial escape and virulence mechanism. Our data (Fig. 9⇑) suggest that there is a window of opportunity for naive macrophages recruited to the site of infection to kill bacilli packaged in apoptotic bodies. If cytolysis of infected macrophages outstrips the capacity of phagocytes to clear apoptotic debris, then necrosis predominates with extracellular spread of infection. A refined understanding of the mechanisms determining the fate of M. tuberculosis-infected macrophages, including both host and microbial factors, is needed to establish the role of this phenomenon in tuberculosis pathogenesis. We thank Birgit Stein and Madhumathi Thiruvengadam for technical assistance, and Drs. Francis Chan and Joseph Keane for helpful discussions. ↵1 This work was supported in part by National Institutes of Health Grants HL64884 and 64517. ↵3 Abbreviations used in this paper: MOI, multiplicity of infection; BCG, bacillus Calmette-Guérin; PEG, polyethylene glycol; PI, propidium iodide; DAPI, 4′,6-diamidino-2-phenylindole, dihydrochloride; ROI, reactive oxygen intermediate; MPT, mitochondrial permeability transition; CsA, cyclosporine A.
Leemans, J. C., N. P. Juffermans, S. Florquin, N. van Rooijen, M. J. Vervoordeldonk, A. Verbon, S. J. van Deventer, T. van der Poll. 2001. Depletion of alveolar macrophages exerts protective effects in pulmonary tuberculosis in mice. J. Immunol. 166: 4604-4611. Keane, J., K. Balcewicz-Sablinska, H. G. Remold, G. L. Chupp, B. B. Meek, M. J. Fenton, H. Kornfeld. 1997. Infection by Mycobacterium tuberculosis promotes human alveolar macrophage apoptosis. Infect. Immun. 65: 298-304. Barber, G. N.. 2001. Host defense, viruses and apoptosis. Cell Death Differ. 8: 113-126. Keane, J., H. G. Remold, H. Kornfeld. 2000. Virulent Mycobacterium tuberculosis strains evade apoptosis of infected alveolar macrophages. J. Immunol. 164: 2016-2020. Keane, J., B. Shurtleff, H. Kornfeld. 2002. TNF-dependent BALB/c murine macrophage apoptosis following Mycobacterium tuberculosis infection inhibits bacillary growth in an IFN-γ independent manner. Tuberculosis 82: 55-61. Riendeau, C. J., H. Kornfeld. 2003. THP-1 cell apoptosis in response to mycobacterial infection. Infect. Immun. 71: 254-259. Sly, L. M., S. M. Hingley-Wilson, N. E. Reiner, W. R. McMaster. 2003. Survival of Mycobacterium tuberculosis in host macrophages involves resistance to apoptosis dependent upon induction of antiapoptotic Bcl-2 family member Mcl-1. J. Immunol. 170: 430-437. Balcewicz-Sablinska, M. K., J. Keane, H. Kornfeld, H. G. Remold. 1998. Pathogenic Mycobacterium tuberculosis evades apoptosis of host macrophages by release of TNF-R2, resulting in inactivation of TNF-α. J. Immunol. 161: 2636-2641. Spira, A., J. D. Carroll, G. Liu, Z. Aziz, V. Shah, H. Kornfeld, J. Keane. 2003. Apoptosis genes in human alveolar macrophages infected with virulent or attenuated Mycobacterium tuberculosis: a pivotal role for tumor necrosis factor. Am. J. Respir. Cell Mol. Biol. 29: 545-551. Schaible, U. E., F. Winau, P. A. Sieling, K. Fischer, H. L. Collins, K. Hagens, R. L. Modlin, V. Brinkmann, S. H. Kaufmann. 2003. Apoptosis facilitates antigen presentation to T lymphocytes through MHC-I and CD1 in tuberculosis. Nat. Med. 9: 1039-1046. Fratazzi, C., R. D. Arbeit, C. Carini, H. G. Remold. 1997. Programmed cell death of Mycobacterium avium serovar 4-infected human macrophages prevents mycobacteria from spreading and induces mycobacterial growth inhibition by freshly added, uninfected macrophages. J. Immunol. 158: 4320-4327. Gan, H., X. He, L. Duan, E. Mirabile-Levens, H. Kornfeld, H. G. Remold. 2005. Enhancement of antimycobacterial activity of macrophages by stabilization of inner mitochondrial membrane potential. J. Infect. Dis. 191: 1292-1300. Rojas, M., L. F. Barrera, G. Puzo, L. F. Garcia. 1997. Differential induction of apoptosis by virulent Mycobacterium tuberculosis in resistant and susceptible murine macrophages: role of nitric oxide and mycobacterial products. J. Immunol. 159: 1352-1361. Rojas, M., L. F. Garcia, J. Nigou, G. Puzo, M. Olivier. 2000. Mannosylated lipoarabinomannan antagonizes Mycobacterium tuberculosis-induced macrophage apoptosis by altering Ca2+-dependent cell signaling. J. Infect. Dis. 182: 240-251. Kim, J. S., H. Y. Kwon, W. H. Choi, C. Y. Jeon, J. I. Kim, J. Kim, J. Y. Lee, Y. S. Kim, J. B. Park. 2003. Phagocytosis of serum- and IgG-opsonized zymosan particles induces apoptosis through superoxide but not nitric oxide in macrophage J774A. 1. Exp. Mol. Med. 35: 211-221. Mohr, S., T. S. McCormick, E. G. Lapetina. 1998. Macrophages resistant to endogenously generated nitric oxide-mediated apoptosis are hypersensitive to exogenously added nitric oxide donors: dichotomous apoptotic response independent of caspase 3 and reversal by the mitogen-activated protein kinase kinase (MEK) inhibitor PD 098059. Proc. Natl. Acad. Sci. USA 95: 5045-5050. Rojas, M., L. F. Barrera, L. F. Garcia. 1998. Induction of apoptosis in murine macrophages by Mycobacterium tuberculosis is reactive oxygen intermediates-independent. Biochem. Biophys. Res. Commun. 247: 436-442. Duan, L., H. Gan, D. E. Golan, H. G. Remold. 2002. Critical role of mitochondrial damage in determining outcome of macrophage infection with Mycobacterium tuberculosis. J. Immunol. 169: 5181-5187. Aleman, M., P. Schierloh, S. S. de la Barrera, R. M. Musella, M. A. Saab, M. Baldini, E. Abbate, M. C. Sasiain. 2004. Mycobacterium tuberculosis triggers apoptosis in peripheral neutrophils involving Toll-like receptor 2 and p38 mitogen protein kinase in tuberculosis patients. Infect. Immun. 72: 5150-5158. Ruckdeschel, K., G. Pfaffinger, R. Haase, A. Sing, H. Weighardt, G. Hacker, B. Holzmann, J. Heesemann. 2004. Signaling of apoptosis through TLRs critically involves Toll/IL-1 receptor domain-containing adapter inducing IFN-β, but not MyD88, in bacteria-infected murine macrophages. J. Immunol. 173: 3320-3328. Lockshin, R. A., Z. Zakeri. 2002. Caspase-independent cell deaths. Curr. Opin. Cell Biol. 14: 727-733. Molloy, A., P. Laochumroonvorapong, G. Kaplan. 1994. Apoptosis, but not necrosis, of infected monocytes is coupled with killing of intracellular bacillus Calmette-Guerin. J. Exp. Med. 180: 1499-1509. Oddo, M., T. Renno, A. Attinger, T. Bakker, H. R. MacDondal, P. A. R. Meylan. 1998. Fas ligand-induced apoptosis of infected human alveolar macrophages reduces the viability of intracellular Mycobacterium tuberculosis. J. Immunol. 160: 5448-5454. Schmeck, B., R. Gross, P. D. N′Guessan, A. C. Hocke, S. Hammerschmidt, T. J. Mitchell, S. Rosseau, N. Suttorp, S. Hippenstiel. 2004. Streptococcus pneumoniae-induced caspase 6-dependent apoptosis in lung epithelium. Infect. Immun. 72: 4940-4947. Sharma, A. K., B. Rohrer. 2004. Calcium-induced calpain mediates apoptosis via caspase-3 in a mouse photoreceptor cell line. J. Biol. Chem. 279: 35564-35572. Zheng, T., M. J. Kang, K. Crothers, Z. Zhu, W. Liu, C. G. Lee, L. A. Rabach, H. A. Chapman, R. J. Homer, D. Aldous, et al 2005. Role of cathepsin S-dependent epithelial cell apoptosis in IFN-γ-induced alveolar remodeling and pulmonary emphysema. J. Immunol. 174: 8106-8115. Guicciardi, M. E., M. Leist, J. G. Gores. 2004. Lysosomes in cell death. Oncogene 23: 2881-2890. Knapp, S., J. C. Leemans, S. Florquin, J. Branger, N. A. Maris, J. Pater, R. N. Van, P. T. van der. 2003. Alveolar macrophages have a protective antiinflammatory role during murine pneumococcal pneumonia. Am. J. Respir. Crit. Care Med. 167: 171-179. Balasubramanian, V., E. H. Wiegeshaus, B. T. Taylor, D. W. Smith. 1994. Pathogenesis of tuberculosis: pathway to apical localization. Tuber. Lung Dis. 75: 168-178. Crapo, J. D., B. E. Barry, P. Gehr, M. Bachofen, E. R. Weibel. 1982. Cell number and cell characteristics of the normal human lung. Am. Rev. Respir. Dis. 125: 740-745. Sturgill-Koszycki, S., P. H. Schlesinger, P. Chakraborty, P. L. Haddix, H. L. Collins, A. K. Fok, R. D. Allen, S. L. Gluck, J. Heuser, D. G. Russell. 1994. Lack of acidification in Mycobacterium phagosomes produced by exclusion of the vesicular proton-ATPase. Science 263: 678-680. Mwandumba, H. C., D. G. Russell, M. H. Nyirenda, J. Anderson, S. A. White, M. E. Molyneux, S. B. Squire. 2004. Mycobacterium tuberculosis resides in nonacidified vacuoles in endocytically competent alveolar macrophages from patients with tuberculosis and HIV infection. J. Immunol. 172: 4592-4598. Turner, O. C., R. J. Basaraba, I. M. Orme. 2003. Immunopathogenesis of pulmonary granulomas in the guinea pig after infection with Mycobacterium tuberculosis. Infect. Immun. 71: 864-871. Pan, H., B. S. Yan, M. Rojas, Y. V. Shebzukhov, H. Zhou, L. Kobzik, D. E. Higgins, M. J. Daly, B. R. Bloom, I. Kramnik. 2005. Ipr1 gene mediates innate immunity to tuberculosis. Nature 434: 767-772. Ciaramella, A., A. Cavone, M. B. Santucci, S. K. Garg, N. Sanarico, M. Bocchino, D. Galati, A. Martino, G. Auricchio, M. D’Orazio, et al 2004. Induction of apoptosis and release of interleukin-1β by cell wall-associated 19-kDa lipoprotein during the course of mycobacterial infection. J. Infect. Dis. 190: 1167-1176. Gil, D., L. F. Garcia, M. Rojas. 2003. Modulation of macrophage apoptosis by antimycobacterial therapy: physiological role of apoptosis in the control of Mycobacterium tuberculosis. Toxicol. Appl. Pharmacol. 190: 111-119. Hsu, T., S. M. Hingley-Wilson, B. Chen, M. Chen, A. Z. Dai, P. M. Morin, C. B. Marks, J. Padiyar, C. Goulding, M. Gingery, et al 2003. The primary mechanism of attenuation of bacillus Calmette-Guerin is a loss of secreted lytic function required for invasion of lung interstitial tissue. Proc. Natl. Acad. Sci. USA 100: 12420-12425. Guinn, K. M., M. J. Hickey, S. K. Mathur, K. L. Zakel, J. E. Grotzke, D. M. Lewinsohn, S. Smith, D. R. Sherman. 2004. Individual RD1-region genes are required for export of ESAT-6/CFP-10 and for virulence of Mycobacterium tuberculosis. Mol. Microbiol. 51: 359-370. Gutierrez, M. G., S. S. Master, S. B. Singh, G. A. Taylor, M. I. Colombo, V. Deretic. 2004. Autophagy is a defense mechanism inhibiting BCG and Mycobacterium tuberculosis survival in infected macrophages. Cell 119: 753-766. Lockshin, R. A., Z. Zakeri. 2004. Apoptosis, autophagy, and more. Int. J. Biochem. Cell Biol. 36: 2405-2419.